Backed by tanks and helicopter gunships, army and riot police on Wednesday cracked down on anti-government protesters driving them out from a landmark square in the heart of Manama leaving at least six people dead, witnesses and officials said. 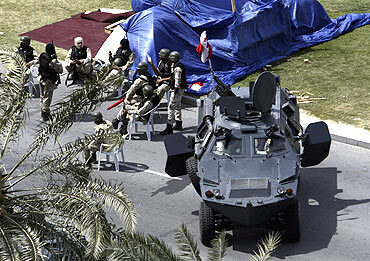 A day after King King Hamad Bin Isa Al Khalifa declared a three-month emergency and imposed martial law, hundreds of riot police swooped down on the protesters in an almost military-style assault at daybreak and overran the Pearl Square in the City Centre after a stiff scuffle with the protesters who have been camping there for four weeks. Officials said three policemen were among the dead during the strike at the protesters. At least three protesters died after police fired on mainly Shia protesters, according to local reports and an official. Bahrain state TV reported that two policemen died when they were hit by a vehicle after anti-government protesters were driven out. The interior ministry also said at least one other policeman was killed, but did not give the cause. Multiple explosions were heard and smoke was seen billowing over Central Manama, as the police with the help of armoured vehicles and helicopters hovering above set the protesters tents ablaze and scattered them into side streets, BBC reported. 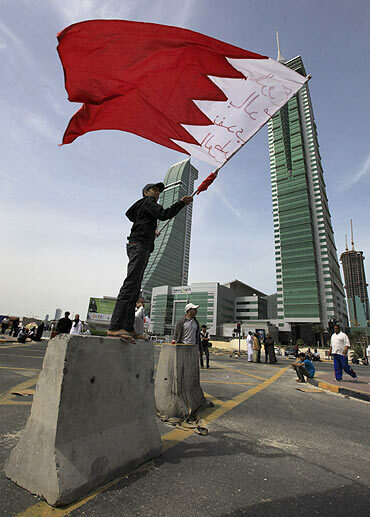 Bahrain is the first Gulf country to be thrown into turmoil by the wave of unrest sweeping the Arab world. The Pearl Square had become a symbol of uprising by the majority Shia against the Sunni rulers of the tiny Gulf kingdom, a nation of almost 5,50,000 people. The Bahrain army action came two days after hundreds of Saudi-led foreign forces entered Bahrain as part of Gulf Cooperation Council initiative to protect government facilities. 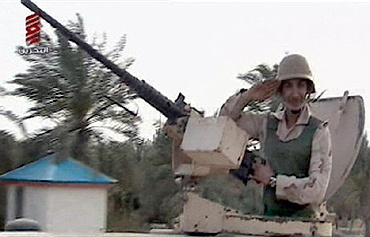 It was not immediately clear whether Wednesday's security clampdown involved Saudi troops. Brandishing automatic weapons and wearing black facemasks, Bahraini troops blocked all roads leading to the country's financial centre, where transactions have been disrupted by the protesters. "This is war of annihilation. 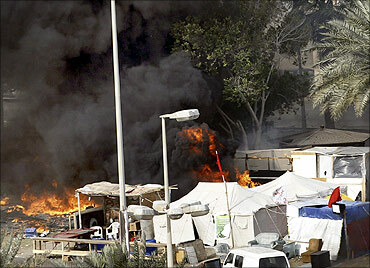 This is not acceptable," Abdul Jalil Khalil, head of the pro-Shiite 18 parliamentary member Wefaq party told Al Jazeera TV. An official statement read out on television said that the king had authorised the commander of Bahrain's defence forces to take all necessary measures to protect the safety of the country and its citizens. Gulf News said that the United Arab Emirates had also sent about 500 police personnel to Bahrain and quoted the Foreign Minister Abdulla bin Zayed Al-Nahyan saying he did not rule out the possibility of its troops also going to Bahrain. 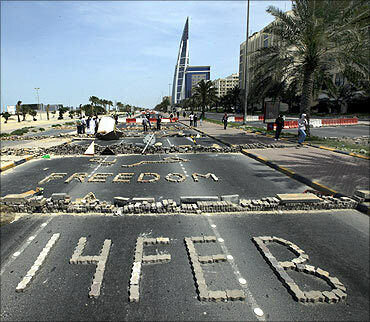 Bahrain, which is home to US 5th Fleet, has been swept by protests over the last several weeks. The protesters allege discrimination and lack of rights and are seeking political reforms including restricting the country's monarchy to a constitutional role only. The authorities have closed all educational institutions and the country's stock exchange suspended trading business. President Mahmoud Ahmadinejad of Iran, which backs Shia Muslims in the region, said the crackdown was unjustifiable and irreparable, and blamed the United States. 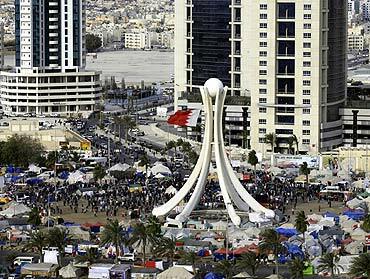 Bahrain State TV broadcast video showing military vehicles in the square flying Bahrain's red-and-white flag as security officials moved through the wreckage of the encampment, set up at the base of a towering monument to the country's history as a pearl diving centre. The video showed the ground littered with debris, including satellite dishes and charred tent poles. Helicopters hovered over the Pearl Square, which was cleared by security forces late last month but was later retaken by protesters after a deadly confrontation with army units. Security forces urged people to refrain from gathering in the capital "for their own safety". 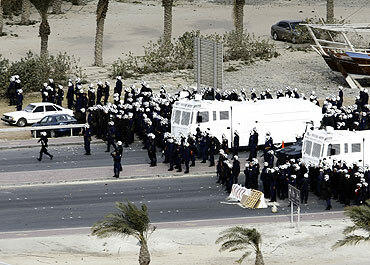 Protesters fled for cover into side streets and security forces blocked main roads into Manama. Mobile phones were apparently jammed in central Manama during the height of the attack and Internet services slowed down. Sources at the Salmaniya hospital said it had been surrounded by troops, and no-one was being allowed in or out. The wounded are now reportedly being treated in mosques or at home. The official Bahrain news agency said the emergency rule bans "rallies and disrupting the public order" and imposes "movement restrictions" and possible curfews in some locations. 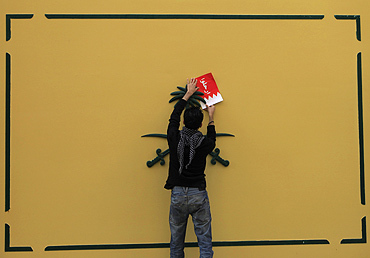 Bahrain's sectarian clash is increasingly viewed as an extension of the region's rivalries between the Gulf Arab leaders and Shiite powerhouse Iran.